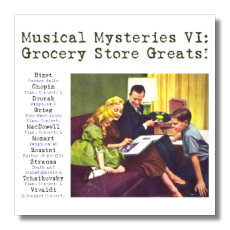 Classical Net Review - Musical Mysteries VI - Grocery Store Greats! If you're about 40 or older, you might have had some of those records housed in dark green boxes with the gold trim in your home when you were growing up. (We did.) Often, longer musical works were sneakily split across more than one record, thereby encouraging one to buy the following week's record, and so on. The boxes contained decent annotations about the music, but one looked in vainfor the names of the performers. In time, we lost our innocence, and we were told that these records were junk. How could they be otherwise, given the fact that they were sold for giveaway prices in grocery stores, and that the performers were anonymous? Old sets or individual volumes of The Basic Library of the World's Great Music ended up molding in the basement, at library sales, or even in the dump. Now that a half-century has gone by, more or less, perhaps it's worth taking a new look… listen, I mean… at the Basic Library, particularly now that most, if not all, of the performers have been identified. Granted, you won't find Arturo Toscanini or Wilhelm Furtwängler on these discs, but you will find many interesting, spontaneous-sounding performances, as well as performers such as the pianist Noel Mewton-Wood, in whom there remains a small but intense knot of interest. The hard-working and relentlessly curious folks at ReDiscovery have issued several CDs devoted to "musical mysteries": recordings in which the performers are either anonymous or pseudonymous. Whenever possible, they have revealed the true identities of the performers, and cleaned up the sound to a rather remarkable degree. The performances themselves often are well worth revisiting. This four-CD set is devoted entirely to recordings from the Basic Library -thus the phrase "Grocery Store Greats!" Indeed, they are not bad at all, although one doesn't sense that hours and hours of studio time were scheduled for any of these give-'em-all-you-got performances. (For their occasional roughness, they are, however, gratifyingly "real" – not dishonest cut-and-paste jobs assembled by engineers post-recording.) I was very impressed with Mewton-Wood's Chopin and Tchaikovsky concertos, both responsibly accompanied by Walter Goehr and the Netherlands Philharmonic. Mewton-Wood fatally poisoned himself at age 31, apparently despondent over the death of his male lover, for which he blamed himself. Mewton-Wood's Chopin is particularly affectionate, yet it is not lacking in strength and brio. One consistently feels that he is taking a new look at the music and how it is to be shaped and phrased, and not merely submitting himself to received wisdom or tradition. Alexander Jenner's muscley MacDowell (with Henry Swoboda and the Vienna State Opera Orchestra) also brings something new to this underplayed but definitely meritorious concerto. (If it is not on the A List, it must be very high up on the B List.) Like Mewton-Wood, Jenner takes off the kid gloves, rolls up his sleeves, and turns in a very exciting and compelling reading. Johannesen's Grieg concerto (also with Goehr) is on a lower level. There are too many imprecisions in the dialogue between the soloist and the orchestra to be overlooked, and he seems to pursue easy effects instead of getting to the core of the work. Goehr's Peer Gynt music left me similarly underwhelmed, and his Carmen Suite is nice but hardlyr evelatory. Among the symphonic works, I was most impressed by Otto Ackermann's thrilling Dvořák, which is filled with loving orchestral detail and personality. (The Vivaldi concerto is Big Band Baroque, but no less enjoyable for that.) Ackermann's orchestra is theZürich Tonhalle Orchestra, and amazingly, even today that group retains some of the identity heard in this performance of the "New World Symphony." Another winner here is Strauss' Death and Transfiguration, with Ignace Neumarkand the Utrecht Symphony Orchestra. Neumark, a Pole who also conducted in Oslo and Palestine, is a forgotten conductor. Hearing this recording, one wonders if its evocative atmosphere and white-hot excitement were just a fluke, or typical of this conductor. If the latter, then are there other examples of this man's conducting out there? Swoboda's Mozart is big but not lumbering, and he accentuates the music's dark colors in an old-fashioned but still relevant performance. Some of these performances have been on CD before. However, is as dramatically shown in a short bonus track, what you might have heard in the past bears little resemblance to what is offered here. Gideon's digital remasterings remove most of the glitches (not all are reparable) without adding echo or other unnecessary sweeteners. Most of his sources were the LPs themselves, but he also had access to tape in the case of Death and Transfiguration, which also is in stereo. Throughout, the sound, like the musicianship, is honest, and it should not get in the way of anyone's enjoyment of these unusual recordings.